Author’s Note: This is meant to be a simple and brief exposition of the goals and strategies of the Maoist movement in India for people who may not have much awareness about it and are confused by the propaganda in the mainstream media. This does not go into the arcane debates about mode of production in India, the debates among communist revolutionaries over strategy and tactics etc. This aims at people who, for example, are perplexed why the Maoists, instead of trying to ensure safe drinking water like an NGO, rather, often resort to violent activities against the Government. The Indian government is launching a full-scale war against the Maoist rebels and the people led by them in different parts of the country. The initial battles, without any formal announcement, have already started. For this purpose, they intend to deploy about 75,000 security personnel in parts of Central and Eastern India, including Chhattisgarh, Orissa and Jharkhand. The government will organize its regular air-force in addition to paramilitary and specially trained COBRA forces. The air-force has begun to extend its logistic support. Prime Minister Manmohan Singh and Home Minister P. Chidambaram have declared the Maoist rebels to be ‘the biggest internal security threat’ to India and a hindrance to ‘development’. The mainstream media seem to have taken them at their face value. Their publications and television programmes seem to be building a war-hysteria against the Maoist rebels regardless of the fact that this attack by the government will be directed against some of the most deprived of the Indian people. Indeed this is turning into a war of the state against its own people! While paying lip service at times to the notion that the current people’s insurgency led by the Maoist rebels has its root in decades of vicious exploitation of the poor, especially the dalits and tribals, the blare of government propaganda tries to convince us that the Maoist rebels are dangerous, blood-thirsty terrorists determined to establish their areas of influence. 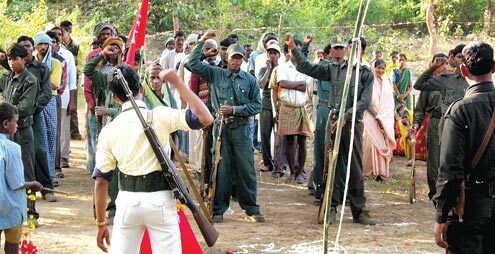 The Government is preaching that the Maoists can go to any extent to maintain their influence in these areas – by either preventing the government from undertaking development activities or using the power of their guns, killing disobedient individuals. Their ideology is to terrorise the common people, wrest power from the democratically elected governments and destroy the entire fabric of the society. In this hour of crisis, we must ask those questions that the government seeks to suppress. What is the state of the people of India at present? With its current high rate of growth, this is also a country of abject poverty and extreme inequality. Home to 24 billionaires (second largest in Asia according to Forbes), India can also boast of 230 million people who go to bed on a half empty stomach (World Hunger Report). A country whose economy grows at 9% cannot feed its own population – at least 50% of the people live below the official poverty line and 47% of children below the age of three are underweight (World Bank report, Undernourished children: A call for reform and action). In this so called ‘hub of knowledge economy’, only 11% of the total population can afford higher education and 50% of the students drop out before class eight to start living as casual labourers (Education Statistics, Ministry of Human Resource Development). This is true of most of India not just the areas where Maoist influence and control is high. Then how can we say that development in India is being blocked by Maoists? –Land to the poor and landless. Later on cooperative farming is to be established on voluntary basis. –Forest to the tribal people. –End of rule of the rich and the upper caste in villages and uprooting of caste system. Uproot all discriminations based on gender and religion. –Seizure of the ill gotten wealth and assets of multinational corporations and their local Indian partners. –Self determination for the nationalities, political autonomy for the tribes. –Establish a state by the poor, for the poor where the present day exploiters would be expropriated. –Participation of people in day to day administrative work and decision making. Democracy at the true grassroot level with people having the power to recall its democratic representatives. Note: For an interested reader, the webpage: bannedthought.net contains an enormous wealth of information about the Maoist rebels, including their own documents. ← Were European Jews Once Palestinian Hebrews?